Since my last blog two weeks ago things seem to be moving on the right track regarding the formation of a Los Angeles Producers League. At each meeting it seemed that the general consensus was that a league should be formed to represent the interests of producers. However, there is still a lot of work to be done: namely, actually forming the group in a legitimate fashion. My personal hope is that this process can proceed slowly enough to allow for the maximum amount of transparency and accountability. Since there has not yet been a public agenda for the upcoming meeting on the 20th, I thought I might outline a few of my thoughts on how to proceed. The formation of a Producers League is paramount to fostering the growth of LA Theater in a responsible way. We all know that it is important to solve the gap that currently exists between the current 99-seat plan and the HAT contract. But other problems persist in our community, making it imperative that we work together to share information, market the concept of live theater, brand our work, solve the goldstar problem, and tackle the many other issues we face every day as producers. Solving these problems will not be easy, and it will take time. But if we don’t work together, if there isn’t a critical mass buy-in for the Producers League, then solving these problems will be impossible. Now is not the time to focus on our differences. Now is the time to work together to get this league off the ground. But how do we form the league in a responsible manner that allows for everyone to feel included? How do we allow for all opinions to be heard without drowning in endless meetings? How do we make sure that this process is open, transparent, inclusive and unifying? 1) We must allow for all producers to be a part of the league. Over time, the group may find that it needs to set levels of membership, or restrictions on what constitutes the role of a producer. But now is not the time to set these parameters. If we start excluding people now, we risk alienating other producers who are important members of our community. For better or worse, the only option for legitimacy is for us to foster an environment of true participation, allowing for everyone’s voice to be heard. 2) We must act democratically. This means that ALL decisions, especially those made in the beginning, must be voted on by the group, with notice of the vote and any supporting material on the vote being shared with the entire group. 3) We must set up a mechanism for information to freely flow between all members. Perhaps there is a way to create a news group similar the Big Cheap where we can become members. 4) We need to elect a transitional committee whose sole function is to certify the voting in the early period of the League, before we set up a structure and elected a leadership. Perhaps a group of 7-13 people would be sufficient. This group must understand that its purpose is not to become the leadership. Their role is merely to count the votes (because someone has to). 5) We need to agree on some type of process that gives shape to how we will determine the structure and the leadership. I recommend that we start the process of voting for a League to form at the meeting on the 20th. First we need to agree to abide by the majority vote of all votes taken by the group. Then we need to first elect the 7-11 members to the transitional committee. Beginning on the 20th, and continuing for a period of 6 weeks, the transitional committee should collect votes in favor of and against the forming the league (thus acquiring members). At the end of six weeks the transitional committee should email all those who have voted to create the league a list of all those that have voted yes. These are the original members of the League. At this point we should allow another 6 weeks for the members to share their ideas as to how to structure the group. Anyone and everyone should be allowed to submit a proposal to the group (using our message board yahoo group). After 6 weeks of discussion, we should request that all members who want to submit a final proposal to the group for a vote to do so. The proposals should include a structure, and leadership positions and the process to elect our leaders. I recommend that we use a Caucus format for voting on the proposals. At a meeting to vote on the proposals the authors should be allowed 5 minutes to address the members to discuss their proposal. After all proposals have been heard from we vote. The proposal that has the lowest votes is removed, at which point we vote again. We continue this process until we have two proposals left and the one with the majority vote becomes the structure. At this point the winning proposal will guide us as to next steps. Transparency + Accountability + Inclusiveness = Legitimacy. I have had many conversations with LA producers in the last three years since I first started my blog arguing for the creation of a producers organization. Often, these conversations come from discussing the wider ills of LA theater, (half price tickets, marketing, rental contracts, etc). We all know this is the case, and we have been talking about it for years. In every single one of those conversations it was agreed that we need a producers organization to address the problems and find the solutions. But the question always comes around to how, and who, and at what cost? And so the proverbial ball is dropped. The LA Stage Alliance has finally picked up the ball in the last month. They have organized 4 meetings for the producers to discuss the formation of a producers organization. So here we are–at probably the most significant crossroads LA Theater has seen in the past 20 years. There was a lot of discussion at the first two meetings, much of it heated, some of it confusing, and little of it with a clear purpose. In fact, as far as I can tell, we, the producers, were invited into this process in the middle. Its like we are building a house, but the floor plan has already been chosen, the foundation already laid, and the walls already built. We have been given the chance to give feedback on the roof style, but the ultimate decision on the roof still does not belong to us. So I think it is time for us to take a step back, look at the big picture and ask ourselves, shouldn’t we be involved in what we want our foundation to look like? Shouldn’t we get the chance to vote for our leaders? Shouldn’t we have the ability to hold our leaders accountable? Shouldn’t our leaders reflect the greater producing community? And shouldn’t they speak for us not because no one else will, but because we elected them to do so? Moments like this come along once in a generation. If we miss this opportunity because we don’t have the energy, time or money to ask the critical questions, then we are going to pay for it for the next 20 years. None of us can afford this. SO, WHAT EXACTLY DO WE NEED ANYWAY? Our organization must be independent and created by the producers, with membership, leaders and funding by only producers. We must all abide by any official majority vote of the producers organization. These two points are critical. As so often happens in a democracy, the people with money wield the most control. But we, as producers, cannot afford to give control of our organization to anyone who is not a producer, no matter how tempting the potential funding. If actors were to create Equity today, they would not allow it to be funded and administered by a third party– they would insist it be an organization of the people, run by the people. As producers, we must do the same. It is imperative that our organization be an independent group run and funded by us. And, in the interest of solidarity, we must always debate, reason, study, and articulate all issues and solutions put forth by the leadership/committees of the producers organization. Once we do so and hold an official vote, we must all live with the majority decision. Anything less will harm the collective, and doom it to failure. OK, BUT WHAT WILL THIS INDEPENDENT PRODUCERS GROUP DO? This group will form the collective to allow for the process of collective bargaining. In addition, this group (which could look like this) can also help solve our larger problems. For example: solving the 1/2 price ticket issue, getting better rental contracts, getting better ticketing companies, create a shared list of companies that are providing good services and a list of companies providing bad services to producers, training new producers, rebranding and marketing (here and here and here), creating a 20 year plan, study the terrible economics of LA theater, and so many other things that will benefit the producer community. This group, in short, will do what is needed to solve the problems that are crippling LA Theater. STEP (1) We must vote, as a group, to form an independent Producer’s Organization. This group must be created by the producers, with membership of only producers and funded by producers. General managers may also be included. STEP (2) The members of the newly formed group must agree that we will all abide by the group’s decisions so long as an official majority vote is conducted. STEP (3) We must build a structure. Every member of the group should be allowed to submit a proposal as to how we should form our group, should they feel the need to do so. Perhaps there are additional options such as contacting the Leagues in New York and/or Chicago and looking at their structures. Proposals should include the general make-up of the electable staff (i.e., President, Vice President, Treasurer, etc) and general rules of order (i.e. Roberts Rules of Order). STEP (4) We will come together as a group and discuss the proposals and vote. STEP (5) Members of the group will nominate themselves to leadership positions. Each nominee will submit a statement clarifying their positions. STEP (6) We will vote for our leaders. STEP (7) The leadership will need to determine the initial cost and how dues should be assigned and collected. The group should vote to accept or reject the leadership’s proposal. STEP (8) We will start the process of forming interest committees. These committees should be created by the membership, not an outside party, and should reflect the way the membership views itself. All committees should be open to all members of the whole group and leadership of each committee should be voted on by the committee (unless another process is decided upon by the larger group). GREAT! WE HAVE A GROUP, LEADERS AND SUBCOMMITTEES. NOW WHAT? Now we really get to work! At this point we need to ask Equity, SDC, and USA to give us some time to research and form our collective opinions. As I stated above, there are a lot of issues that LA theater producers have to deal with that are not related to unions. We need to begin to develop solutions to those problems before we can move forward with collective bargaining. After all, how can we explain why the top ticket price needs to be raised if we have not collected enough data on the problems inherent in ticketing price structure? How can we explain what we need to extend our hit shows if we have not done the research to back it up? We need to ask some tough questions and study some outside-the-box solutions. The entire group needs to participate in decision making. Once we have a plan, a real plan with actionable items that hold us all accountable, only then can we start to collectively bargain. If we have the data to back us up, and solutions in place, the unions will become our allies in creating an environment where we can all truly succeed. I believe that there are two basic ways to judge a show. 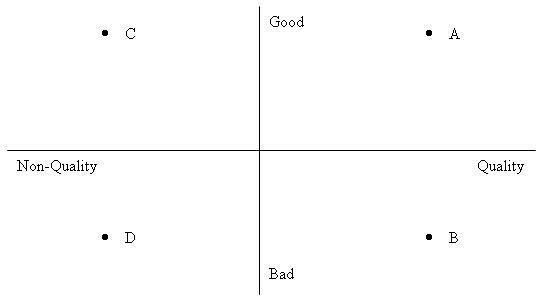 One scale is “bad to good.” The other is “non-quality to quality.” I cannot define what makes a show bad or good because the elements that make a show bad or good are very subjective. For the ease of my argument, however, I will propose that a good show is a “hit show” that receives strong word of mouth praise and high marks from the critics in regard to the performance of the actors, director and author. One thing I can do is to define a quality show. Simply put, a quality show is a show that looks expensive. It is a show in which the producers have spent a good deal of money on the sets, costumes, lights and sound, and hired solid musicians (if it’s a musical). Based on this distinction, it is important to note that “quality” does not imply “good.” We can all think of scenarios in which a quality show is actually bad, and a non-quality show is actually good. Put another way, good theater doesn’t need expensive bells and whistles, and throwing money at a bad piece of theater will never make it good. Here is another way to look at it: All shows on Broadway are high quality. When you buy a ticket to a Broadway show, you know that it is going to be a high quality show, because part of what makes Broadway “Broadway” is the use of material resources to make a show look fantastic. But I would venture to guess that we have all seen some really bad Broadway shows. Hence the idea that throwing glitzy sets and lights at a bad piece of theater can never make it good. On the other side of things, I would venture to say that all virtually Los Angeles 99-seat theater shows are low quality. Practically speaking, you simply can’t spend a lot of money to make these shows look like a million bucks. But we have all, of course, seen some amazingly good 99-seat theater shows. Now, it is true (and important to point out) that the 99-seat theater scene in LA has a wide range of “quality” elements. Most showcase productions and beginning theater companies are generally the lowest quality because they have very little money to spend on their productions. And there are some 99-seat theater shows in LA that are higher quality; certainly not on par with the quality of the Ahmanson (which we can safely say is Broadway quality), but better than showcases. Again, quality does not mean good and good does not mean quality. On the graph above, I have plotted four different productions. Point A is a good Broadway production. Point B is a bad Broadway production. Point C is a good 99-seat theater production and point D is a bad 99-seat theater production. Now, point A (good Broadway production) and point B (bad Broadway production) are both seen more favorably to point C (good 99-seat theater production) and point D (bad 99-seat theater production). The biggest problem for the LA 99-seat theater community is this: Even though a patron wants to see a good show, when it comes down to buying a ticket, they will likely be more willing to pay to see a quality show. Now, before you get mad at me, think of this: some Broadway tours that come to the Pantages are bad shows, but they manage to sell out 2,700 seats, 8 times a week. Whereas smash hit, great 99-seat theater shows often struggle to sell out their 396 seats each week. Marketing (or lack thereof) has a lot to do with this problem–a big tour spends more on marketing that the most expensive 99-seat theater show’s entire budget. But there is another important element at play here that, in fact, determines the success of all marketing: The brand. IF Broadway = Quality AND Quality = Good THEN Broadway = Good. IF LA 99-Seat = Non-Quality AND Non-Quality = Bad THEN LA 99-Seat = Bad. Whether we like it our not, this is what is happening to us in LA. Yes, it is true that in Los Angeles we may be able to sell out a show and get people to come see us in the 99-seat world (We sold over 5,000 tickets for Divorce! The Musical). But we cannot ignore the fact that Wicked ran for over 800 performances in a 2,700 seat house (The Pantages) here in LA. If people understood that a particular production in a 99-seat theater house was as good as, or better than Wicked, then wouldn’t it make sense that the same number of people would go out and see the 99-seat theater show? No! Because a good 99-seat theater show has to overcome the negative brand of, “LA 99-seat theater equals bad.” And that is a tall order, given that most 99-seat theater shows spend less than $1,000 a week on marketing. The obvious solution is that all 99-seat theater producers should run out and spend as much money as possible on building better sets and costumes, right? Well, no. Because, unfortunately, 99-seat theater producers are locked into a system wherein we have to produce on the extreme cheap– a direct result of the price controls that Equity has forced upon us. The plain truth is that the current Equity 99-seat contract forces us to lose money on these productions. So, even if a producer wanted to spend more money to increase the quality of his/her production, he/she couldn’t, unless he/she wanted to take a huge loss. Who can afford to do that? So with the economic realities of LA theater being what they are, producers keep churning out low quality productions– both good and bad. And this, of course, reinforces our “low quality” brand. Surely, a producer could remedy this by producing on the HAT or LOA contract, right? After all, if the 99-seat theater ticket price controls are the problem, then producing on a HAT or LOA contract would solve the problem since the HAT and LOA provide for higher ticket prices than the 99-seat contract. Right? The answer here is, sorta, but not really. It is possible that a producer can produce on the HAT or a LOA. And some producers do. Right now there are productions running in 99-seat theaters that are on a HAT or a LOA. But the patrons don’t know that a producer is doing this. And if the patron doesn’t know, then the LA-99 seat theater brand of Low-Quality will still apply. Additionally, producers rarely use these contracts to increase the quality of their productions; they use them to increase the “good” elements of their productions– namely, to hire better actors. And it is extremely rare that a producer actually charges more for a ticket than the 99-seat theater contract would have allowed in the first place. While raising the “good” is good, it doesn’t do anything to change 99-seat theater’s overall “low quality” brand. So really then… how do we fix this? Well, it’s a loaded question. Certainly, the answer is not to go out and produce Broadway shows in 99-seat houses. But, we do need to take this issue of quality more seriously. We can’t just stick our heads in the sand and say “Our shows are good, and audiences should know that,” then turn around and complain that no one comes to the theater anymore. The first step is for producers to accept the distinction between quality and good. It’s hard for us producers to look in the mirror, but we have to. And we have to do it as businesspeople, not just as artists. Once we accept this distinction, we then need to come together as producers. We need to define the parameters of our work, and the goals of our community. With those definitions in place, we can begin to control our brand, instead of having our brand control us. We can fight to make the necessary changes to the Equity contracts that are hurting our productions. Over time, with the correct strategy, a solid plan, and a defined brand, we will pull ourselves up and create a higher quality 199 seat theater scene, and then an even higher quality 299 seat theater scene. It’s a long road and a hard road. But if we really care about theater in Los Angeles (and I know that we do because most of us do it for little or no money), then we simply have to come together and start a producer’s organization. But, in the meantime, if you are a producer, ask yourself if you would rather produce a good show, or a quality show? This is a trick question. The answer, or course, is both. There are many reasons why we need a producer’s organization. They range from collective bargaining, a trade organization, someone to brand us, management of a better business bureau of theater, etc. But there’s another important need here: the need for us to take care of our new producers. Especially the producers who don’t really even want to be producers. In Los Angeles it’s very common to find a person producing a show because he or she wrote, starred in, or directed it. A few weeks ago I received a phone call from one such “producer by default” who was in the middle of an 8-performance run of a show that he wrote. He called me looking for advice on how to fill his theater with paying patrons and get the word out about his play. Unfortunately for him, he had spent little to nothing on marketing and PR. Given his limited budget and where he was in the run, there wasn’t much I could tell him. With so little time left, even if he managed to somehow come up with 10-20K for a marketing campaign, there would have been no way to make it back even if he sold out his remaining 4 performances. I told him that all he could really do at this point would be to offer “pay-what-you-can” and discounted tickets through facebook and similar channels. Maybe he could try buying one e-mail blast from a marketing agency. Of course, if this producer had called me before he started his run my advice would have been very different. I would have told him to budget for and hire a top quality PR company and to put aside money for a marketing campaign. We could have talked about goals and the results he wanted to see come out of his production. We could have tailored his budget and spending in order to achieve those goals, or change the goals to fit the parameters of what he could afford. This story is so common in LA. So many writers/actors/directors produce their own work simply so that they can work as a writer/actor/director. But so often they don’t know how to produce. Worse yet, they don’t end up producing at all, but rather, begrudgingly managing the production. Producing is not easy, and neither is directing, acting, or writing. And when you do two (or more!) at the same time it’s even harder. Especially when you really only want to be directing, acting, writing– not producing. One of the underlying problems this creates is that many shows, often referred to as showcases, are produced in the same theaters as bigger shows that are not showcases. When these showcases are produced poorly or mismanaged, they tend to reflect poorly on the quality of that particular rental theater (not to mention reflecting poorly LA theater as a whole). Unknowing patrons do not distinguish between a showcase and higher quality productions. Because of this, for those of us who are not producing showcases, it is in our best interest to mentor, support and work with people who are producing showcases. We need to help them produce smartly, efficiently, and realistically. Because at the end of the day, their product reflects on our product. A producer’s organization could help foster and nourish these types of relationships between producers. New producers could join the organization and gain access to resources, support and advice. We could create databases, helpful guidebooks and producing templates. We could explain the way budgets work, not to mention de-mystify ROI’s and recoupment schedules. We could teach best practices for marketing and PR, and we could help new producers identify when they need a lawyer, accountant, and bookkeeper and when they don’t. This collective knowledge base would be more than just a phone book of designers and rental theaters. It would be a network of real people with real experiences who can really help. And if a new producer needs further help, we could provide a list of producers for hire (or general manage). It’s silly for every new producer in town to have to reinvent the wheel. And its damaging to all of us. Why not help each other along the way and in so doing, raise the bar on theatre in Los Angeles as a whole? So things seem to have gotten a bit heated between me and Steven Leigh Morris. Here are the two posts (here and here) and his comments are in the comment section of each. This will be my final post or comment on this subject because I feel that, by now, I have made my case. I don’t want to go on and on repeating myself. I do stand behind everything that I have said. If people want to keep the debate going, I will continue to post the comments that come in, but I will not respond because I am not sure I have anything more to add. ATCA understands “professional” to mean you are paid for your reviews and there is some editorial or other supervision of your criticism – e.g., it is not disseminated only on a personal, unsupervised website. I would also expand that to include anyone that can demonstrate the ability to write a critique that is thorough and well supported while remaining free of conflicts, paid or unpaid. But I have never actually said what my full criteria is nor have I said that only I should decide, I have suggested that we elect a committee to decide what the criteria is and that they would then make sure that all critics met that standard. Clearly, my suggestion of a committee to vet critics has struck a chord in many people. Though I find it a bit shocking the number of people who are arguing the laissez-faire argument. It’s a completely valid argument, but there are a lot of problems with laissez-faire, just look at our health care system and our financial markets. I am glad that as a critic you want to provoke discussion of theater and how it fits into the fabric of our community. That is a good thing, we can agree on that. And I will agree that it takes the form of commentary, I misspoke there. And I don’t care if you aren’t worried about marketing, but trust me the producer sure is. It’s a bit disingenuous to insinuate that critics are not aware that that is at least part of the game. However, I am starting to see that there might be a dramatic difference in how we each look at theater in general. First and foremost, to me it is a business. An artistic business, but a business nonetheless. I think maybe you look at it in more of a pure art form, separate from business. There is nothing wrong with either view. But as a businessperson, I look at the current landscape and I say, huh, this isn’t working for me. I can’t make money here. And since 99% of the shows that run in this town are run by non-profits, I would assume that I am not the only one that feels that way. So when I approach producing in LA I am looking at it solely as a place to develop a show, before I take it to a town where I can turn a profit. How many shows run in LA and then go on to bigger and better, profitable productions in other cities? There are good handful. But wouldn’t it be better if shows could be profitable in LA the same as they can in Chicago or NY? Wouldn’t that benefit everyone? So as I look at this landscape of critics I see so many places where we could improve. At the top we have some wonderful critics, you among them. But then as we go down it start to get murky, because you can see a scale that goes all the way from the top down to the goldstar review. And right in the middle there is this murky area, some people are writing quality reviews that aren’t getting read at all, and some are low quality reviews that are being read by a lot. This doesn’t serve anyone. We need quality criticism, because the quality critics hold us, the theater creators, accountable for what we create. We should be praised when we succeed and questioned/called out when we fail. I want you to be a critic. I want everyone that wants to be a critic, to be a critic. I just want them to be the best critic they can be and free of conflicts. And then we can create the best theater we can. And then, slowly, we can rise above what this town has become. We can challenge NY and Chicago for theatrical legitimacy. (And don’t tell me we can’t because of Hollywood. London does it. Case closed.) We have the writers. We have the actors. We have the directors. We have the designers. The talent is here. And you know what? Some people are just not going to be able to participate because they just don’t have the talent. And that is called life. We award awards to people who achieve excellence in theater. We have the Ovations, the LADCCs and the LA Weeklys. We award them because we want to recognize them as the best. Why can’t we also recognize the critics that are the best? And with that, I will sign off on this topic. I wrote a blog ready to go for yesterday, but then I received a comment on my blog from Steven Leigh Morris at the LA Weekly. He disagrees with my post about critics not being actors. So I thought, instead of answering his comment with a comment of my own, why not make it the subject of another post? Here is the original blog and Steven’s comment is in the comment section. You’re writing criticism on your own blog — commentary or not, you’re taking on the tone of a critic — while being a producer in the field you’re writing about! By the merits of your own argument, you shouldn’t be writing your blog. Does that make any sense? I’m actually interested in what you have to say, but you’re arguing against yourself. This does not make sense and I think it is a rather weak argument. Yes, it is true that I am being critical, but unlike a critic, my job is not to affect the audiences who are seeing a particular show. My writing a critical blog post about theater in general is not remotely the same as professionally critiquing a performance. A theater critic has a responsibility to write thoughtful and thorough critiques about particular productions. Critics do not write op-eds or commentaries. Critics accept free tickets to performances, which implies a mutual understanding as to what the critic will do– namely write a fair and honest critique of the production. The show’s producer then uses the critique to market the show. When a review is a rave, it is meant to be a stamp of excellence. It is something that patrons rely on to make a decision as to whether or not to buy a ticket. Most importantly, critics must adhere to ethical standards. In contrast to this, I simply write commentary. I have no responsibility to anyone but myself. I have no ethical code that dictates what I post and what I write. Sure, my perspective is that of a Los Angeles theater producer. And my goal is to highlight an issue that I feel is a problem and then offer a solution. But I have no direct effect on any productions. Now with that out-of-the-way, lets move on to the rest of Steven’s comment. I think everybody should wear clean underwear while being in public. It’s good for public health and personal hygiene, and it legitimates the public sphere. But if you eliminate all the people who aren’t wearing clean underwear from the public sphere, there will be nobody left in public. Can we please get real about this issue for a moment? People who write about our theater do so because they care, a caring that has little to do with financial incentives. They often care because they are involved in the field. Let me reiterate what I have already expressed. I don’t have any issues with bloggers writing anything they want. I am saying that unless you understand the role of a critic and are willing to abide by the ethical standards of a critic, you should not call yourself a critic. Write whatever you want on your blog. Make a list of your top ten shows; make a list of your favorite theater companies. Stand on a roof and shout that you love a particular production. I don’t care. Just don’t call yourself a critic! And, again, if you are an actor writing reviews, this poses a conflict of interest– pure and simple. There is no possible way to argue against this conflict. If a person tries to argue that “people can leave it at the door” or that “an actor-critic won’t review a show at a theater company where he/she has worked,” etc, this person would be admitting that, at its core, a conflict of interest exists between these two professions. Otherwise, they wouldn’t have to use these qualifiers as part of their argument. There’s a gaping hole in Larry Bommer’s argument — “the reader should be told about this conflict–which instantly invalidates anything the writer can say.” That’s nonsense. Your being a producer, which you’ve made abundantly clear, doesn’t necessarily invalidate “anything you have to say,” it puts it in a context that I can process and draw my own assessment from. Larry Bommer is talking about critics. He is not talking about me, since I am a producer and not a critic. If I was writing actual reviews, then my being a producer would, indeed, invalidate what I have to say. After all, if I was writing reviews, and another producer was writing reviews, couldn’t we make a deal to give each other mutual raves? No one would be able to prove that this was our motive because reviews are so subjective. You can’t disprove a review. But isn’t it clear how easily this could happen? If we want to be a professional town, we need to have theater criticism that is a true barometer of achievement. And we need to know who our professional critics truly are. When actor-critics and bloggers are treated on equal par with professional critics, it drowns out the professional critic’s voices. This, in turn, causes several things to happen: First, professional critics lose their jobs. (Why should a newspaper, which is losing money, employ a critic when there are people out there just blogging reviews for free?) Second, when the professional critics lose their jobs, the only way they can continue to review shows is to start blogging themselves. This causes them to get lost in a sea of blogs, rendering their voices obsolete. Slowly, patrons stop being able to tell who is who. This confusion will lead to a point, if it hasn’t already, where people write reviews that highlight the “good efforts” of theater-makers, rather than honestly critiquing their performances. When the public has no way to tell the professional critics from the non-professional critics then we should just call the whole thing off and stop giving out press comps. It would be easier and safer for a producer to make up fake reviews on his/her own. Indeed, “criticism” would descend into nothing more than a collection of goldstar patron reviews. And don’t tell me this isn’t happening. I have had far too many conversations with people who constantly complain about the downturn in quality theater reviews. This might not be a popular thing to say in public, since no one wants to anger the critics… but it needs to be said. Full disclosure is the key to this argument — then let the readers decide. That’s what they do in the literary world where authors are the main critics in book reviews. It does NOT invalidate the writer’s view, it exposes the tangled webs of our profession and thereby presents the writer’s argument in a glow of honesty, and thereby, credibility. It looks like Steven is actually saying that we should have full disclosure as to who is who– professional, amateur, etc. But where is his bio on the LA Weekly site? I can’t find it. For that matter, I can’t find a bio for any critic posted on the LA Times’ site. Or Variety’s. If Steven agrees that full disclosure is the answer, then let’s put those bios up online, and make sure they are complete. Let’s know who we’re dealing with– both at our papers and in the blogosphere. If you have a problem with your landlord, you can call up a random person– say, me– and I can probably tell you what to do. The reason I can probably give you advice is because I have had rented apartments before and know what it’s like to have a problem with a landlord. I have first-hand experience. In addition, I have read the California Landlord Tenant Handbook a bunch of times, cover to cover. But, I am not a lawyer. I have no right to practice law. And it’s possible that I might very well screw up your situation simply because I’m not a lawyer, and therefore, my advice is not legal. That is why we have the Bar Association. The Bar Association decides who practices law because California has decided that it is in the best interest for the general public to have a qualified group vetting lawyers. All these professionals need a license, because somewhere along the way, the community at large decided that we want these professionals to abide by certain rules obligating them to provide certain standards of service. That is what I am asking for. I ask that we set up a committee, voted on by the members of the LA Stage Alliance, that will set up guidelines outlining the standards we wish critics to employ– including remaining free from having conflicts of interest. Thereafter, we can set up a seminar to help train anyone who wants to be a critic, who doesn’t yet meet these standards. Here is an example of just such a class. I promised I would get back to the dirty underwear quote. I guess I will simply say that I don’t really care if people walk around wearing dirty underwear. But if you take off your pants and tell me that you have the authority to discuss professional laundering techniques, then your underwear had better well be clean. It is no secret that there are plenty of people who make money in this town on the backs of producers. And while I have no issue with people making money, I do have issue with people who behave unethically in their pursuit of profit. I am sure that every producer in LA can tell a story of how this person or that company screwed him or her in some way. But all too often these companies/people get away with this behavior because no one stands up to them. During the run of a show, most producers don’t have the resources to engage a company or theater that is behaving unethically. And after the run, if a producer speaks negatively about a person or company, they are accused of sour grapes, or worse. All this happens while the rest of the community just goes about their business. The producer has nowhere to turn, and no one to help hold the unethical company/person accountable. Well, what if we all worked together to hold unethical companies accountable? What if we had a Better Business Bureau of Theater that would take complaints? What if all the producers got together and started to rate companies/people based on producer feedback? If we had a producer’s organization, we could set up a database that could track every company/person a producer hires. It could work like this: at the conclusion of each show, a producer could rate the various companies/people who were hired on the project. If there was a problem with a ticketing company or a theater, then you could give them a low score. If your PR Rep or Marketing Rep did a great job, you could give them a high score. Over time, we would be able to see a pattern emerge: companies who are behaving ethically would likely retain higher scores, while companies that aren’t would clearly show lower ratings. Producers could then look at the ratings and steer their hiring practices toward companies that are rated highly, thereby avoiding companies that are not delivering. The more producers that participate, the better the data would be. And securing this data is exactly how we, as producers, can hold companies, theaters, and people we contract with accountable. When a company constantly receives a low rating then the Producer’s Organization would reach out to them and try to understand the cause. The Producer’s Organization could set some guidelines as to what we (the producers) expect from companies and people who we hire. If the company works to correct the issues, then great! The rating would naturally go up, allowing that company to start anew. If they refuse to change, however, then the members of the Producers Organization would likely avoid using that company in the future, thus limiting their business. Let’s shine some light on the business side of theater. If we do it together, then we can illuminate a lot. In the end, I think we will find a large number of very reputable people providing excellent services in the LA theater scene– people who deserve our raving reviews, and who deserve to make a profit. We will probably see a few undeserving ones as well. And we can make sure that those companies are held accountable. Last week I talked about how we need to organize a committee to vet critics and designate the official theater critics of Los Angles (Click Here). Its time for our critics to be critics and only critics. Now, I am not saying that these conflicts happen every day. Nor am I saying that a critic cannot objectively review others while also participating in the theater community in another capacity. What I am saying however, is that when a critic is also an actor, director, designer, board member, or company member, there is a possibility of “I’ll scratch your back, you scratch mine,” and this possibility should completely invalidate anything the critic as to say. It’s a good question because it’s a common conflict of interest (as in too much interest if you catch my drift). Nobody can be taken seriously–what we call credibility and confidence–as a critic if he or she is also offering their services, whether as directors, actors, designers, publicists, or board members, to the same “market” that they critique for a living. It is a problem of appearance as much as reality. How can you trust someone’s praise or blame of another actor or theater when you can’t be 100% sure that their own self-interested concerns aren’t entering into the judgment call? They may be currying favor or intent on payback. Their resume may be the real motivation for their pans or praise. The core problem is that the reader should be told about this conflict–which instantly invalidates anything the writer can say–which is why he or she should not be writing reviews in the first place. It’s just too easy to conceal corruption under the guise of criticism. So there you have it. If the ATCA thinks this situation presents the theater community with a conflict of interest, then why don’t we? Last week, when I called for the LA Stage Alliance to create a committee to vet the critics I received some emails asking how we could ever agree on criteria to judge a critic. I say that rule number one has to be that a critic is only a critic. Perhaps rule number two should be that a critic must be a member of the ATCA. Or at the very least, the LA Stage Alliance committee should work with the ATCA to help vet the critics. Some people emailed me and thought that the Los Angeles Drama Critics Circle (LADCC) should be responsible for vetting our critics. But the LADCC doesn’t uphold my “rule number one” when some of its current and former members are simultaneously critics and actors, critics and performers, or critics and members of a local theater. Since the ATCA is clearly against this conflict of interest, shouldn’t we hold the LADCC to the same standards? Shouldn’t the LADCC set the highest standard for professional theatrical criticism? By allowing this conflict of interest to remain in play within the LA theater community, the LADCC is casting a shadow of doubt on their own legitimacy and the LADCC awards. How are we to believe that these nominations aren’t chosen based on one of the critics’ hopes that a director will cast them? Or even worse, how can we trust that a critic who hasn’t been cast in a show they wanted to be in isn’t turning around and squelching nominations? Again, I am not saying this is happening; I am saying that it could happen. None of us should accept a theater community that perpetuates this conflict of interest. It is imperative that we work to change this situation. Again, I call on the LA Stage Alliance to create a committee to vet our critics. We must have clear criteria as to what constitutes a professional critic. Part of this criteria must be that our critics are not, under any circumstances, performers, press reps, directors, designers, board members, or hold any other position within the theater community that is in direct conflict with their ability to fairly and independently critique. Furthermore, I call on the LADCC to institute a policy that any member must only work within the LA Theater community as a critic and/or journalist. After all, you would not want an employee of Exxon in charge of regulating oil companies. It used to be that you knew you could trust an arts journalist/critic because he or she worked for an accredited newspaper. It was safe to assume that a newspaper would hire a competent, educated, knowledgeable writer to write theater reviews. But in the new world, as newspapers fight for their lives, theater critics are being let go left and right. Most of them are turning up on blogs or on theater websites. Some disappear forever. Meanwhile, while we lament the death of the newspaper and arts journalism, a completely new crop of internet bloggers is popping up online. If we stop and take stock, we will see that there are now more people writing about theater than ever before. While it’s great that we have so many people writing about theater, what we end up hearing is a smorgasbord of different voices and no clear way to tell them apart. On one hand, we are still blessed with the educated opinions of reviewers who used to work for reputable newspapers. On the other hand, we have become bombarded by a group of bloggers– for the most part ordinary people who see at lot of theater and have their own web presence. There is certainly nothing wrong with citizen journalism. In fact, it’s an exciting new trend that is opening many doors for great writers. The problem is that bloggers are just another form of word of mouth– a kind of public platform for targeted gossip. I want to be clear that we absolutely must support these bloggers. Their passion and desire to write publicly about shows they like is one of the main forces keeping theater in Los Angeles alive. We should engage with them, nourish them, and support them. After all, good word of mouth is what we all strive for with our shows. What we should not do, however, is call bloggers critics. Our audiences deserve to know the difference between a blogger who is spreading word of mouth and a professionally trained theater critic. In the current state of LA Theater the LA Stage Alliance is the defacto leader of the theater community. In light of this, I propose that the LA Stage Alliance form a committee, voted on by its members, whose task would be to evaluate arts journalists who review theater in LA. Here’s how it would work: Any writer who wants to be designated as an official Los Angeles Arts Journalist/Critic would submit a selection of their work for review. The committee would then evaluate and score their work. Writers who receive a high score, would receive accreditation from the LA Stage Alliance and be designated as a LA Stage Alliance approved Arts Journalist/Critic. They could publicize their accreditation, and put an official logo on their website/blog. Basically, this approval process should be similar to the process of being hired at a newspaper. Meanwhile, the LA Stage Alliance would need to work with the theater community to promote and market its Arts Journalist designation and to make sure that the public knows the difference between a designated Arts Journalist/Critic and a word-of-mouth blogger. Once the general patrons know the difference they will have a better understanding of how to evaluate online content. The LA Stage Alliance will also help the accredited journalist by promoting all websites by categorizing them as official Critics or blogger. In addition, the LA Stage Alliance can put together journalistic seminars to help bloggers wishing to become accredited Arts Journalists receive the designation. We could implement partnerships with USC’s Annenberg School of Communication program, facilitating ways for journalism professors to run such seminars. Bloggers could attend and submit their work to the committee to be reviewed. With the help of these seminars, casual bloggers could soon become credible arts journalist. It will also be necessary for theater companies and producers to use press quotes from designated journalists only. When a producer uses a quote from a random blogger on their press materials, it reflects poorly on both the show and the blogger. Additionally, it delegitimizes the entire theater community. By only using designated journalists we will help to promote them, thereby increasing the importance of the designation. Let me be clear: the purpose of implementing this type of structure is not meant to create an elite group of writers. We should continue to encourage bloggers to get out there and make their voices heard and spread word of mouth. After all, the more publicity they help generate for our shows, the better! We have to have ways, however, of distinguishing between the many voices we hear. Treating a blogger as being the same as a professionally trained critic will only delegitimize our professional critics. If indeed newspapers are going the way of the dinosaur, and will soon no longer be around to vet arts journalists, then its time for us to do it ourselves. We have a communication void in theater. This communication void is between artists and patrons. It’s always been there, only now with the new world of blogs, social media, chat forums, etc, the silence has become deafening. It’s time for a paradigm shift in how the theater community as a whole interacts with our patrons. In the old world, we might have a talk-back now and then, and ask our patrons to fill out marketing questionnaires. We would measure our success in ticket sales (profit success), and in the number of good reviews and awards won (artistic success). But, in the new world, we have to do more. We have to engage our audience. We have to discuss why we chose/wrote the play, what we hope to accomplish, and what it means to us. Then, we need to invite our audience to tell us what they think. And we have to respond. And we have to do it publicly, on our websites, on chat forums, on facebook, etc. Because in the new world, if we want theater to be relevant, then we must measure our success by the conversations we inspire. We spend a lot of money in the arts trying to understand our patrons. We research every demographic possible to find out how much money they make, what zip code they live in, what shows they like to see. We hire companies to compile all this info and break it down for us so we can better market our shows. And it is true that this info is helpful when we market shows. But it doesn’t really help us understand our patrons. What questionnaires don’t offer, is a forum for us to listen. In the theater community, we often like to think of ourselves as more than just “entertainment.” We like to think we are making a difference in some capacity. It’s why most of the people involved in the 99-seat theater scene aren’t paid, or are only paid very little. “We sacrifice our income for our art” is a common refrain heard in dressing rooms around town. For more proof, you don’t have to look much farther than the mission statements of most of our theater companies. Often, they go something like this: “Our mission is to begin a dialogue with our community by contributing a vital voice on the relevant topics of today.” If we are to stay true to our stated missions, we should be measuring our effectiveness not by box office receipts and awards, but based on our mission. If our mission is to begin a dialogue, create social change, or raise awareness of whatever issues our particular show is dealing with, then shouldn’t we be talking and more importantly listening to our patrons? After all, they sit through an entire show listening to us. This new world of internet communication and social media will soon render the old communication models outmoded. In the old world, communication processes occurred one-way: from theater creators to the patron. But things have changed. Communication is now, across almost all industries, a two-way street: from theater creators to patrons, then from patrons back to theater creators. Sadly, I think many people involved in creating theater in Los Angeles don’t yet understand this. All too often around Los Angeles you can hear the theater community lament the rise of the “Uneducated Los Angeles Theater Patron.” And more often than not, our creative community shuns patron feedback and patron reviews on sites like Goldstar or Theater Mania. This type of response is short-sighted and detrimental. People want to be able to take part in something. They want to be in the know. If people are talking about a specific film or television show, then they will go see it. They want to have discussions. Our job is to not only encourage these discussions, but to start them and take part in them. We can do this by encouraging our audiences to talk to us publicly on our websites, in theater forums, on facebook, and best of all start blogs. We can find creative new ways to open up these discussions online. We need our patrons to tell us what they think, what we are doing right, and– yes– what we are doing wrong. Most importantly, once we’ve invited our patrons to talk to us, we have to respond. We have to explain our choices, educate our audiences and allow them to educate us. It’s no longer enough to “let art speak for itself.” It’s time for art to listen, and respond.